Life has been such a wonderful journey and thanks to all of my friends and family, it truly has been a blessing! I also want to give praise to my wonderful boyfriend, Dominic, who has surprised me with a trip to Sheraton Maui Resort & Spa for my birthday! Thanks for visiting my trip website and my registry! This Hawaiian getaway at Sheraton Maui Resort promises an unforgettable experience in the tropical charms and exotic luxuries of paradise! Thanks to your thoughtful contribution, it will be time to take comfort in the sumptuous settings of the room, indulge in tantalizing cuisines, enjoy an array of thrilling activities and discover a place of peace and calm in the spa. Exploring the enchantment and mesmerizing beauty of the islands on this Hawaiian holiday will be a wonderful gift! With your lovely gift, the experience of a lifetime at Sheraton Maui Resort on this Hawaiian getaway awaits! Discovering the true essence of the islands includes lush natural beauty, pristine beaches, sparkling waters and the welcoming spirit of "Aloha". In paradise it will be time to luxuriate in the enchanting settings of the room, indulge in world-class cuisines, take part in thrilling activities, and journey to a world of tranquil bliss in the spa. 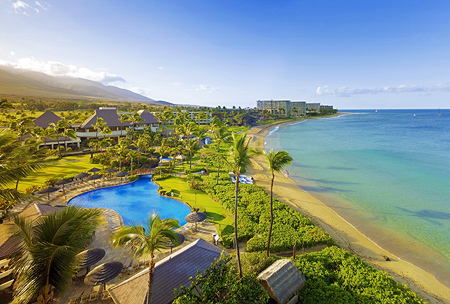 Sheraton Maui Resort presents an exceptional island getaway that is just as alluring as it is mesmerizing! A bottle of champagne will be delivered to the room on this Hawaiian getaway at Sheraton Maui Resort and Spa! While taking in the stunning views from the room, a toast will be made with a delightful bottle of champagne! With your thoughtful gift, it will be time to indulge in a sumptuous sweet treat on this Hawaiian getaway at Sheraton Maui Resort and Spa! A personalized celebration cake will be delivered to the room. Enjoy a decadent treat from the comfort of the suite at Sheraton Maui Resort and Spa! A platter of fresh, succulent strawberries covered in rich milk chocolate will be delivered to the room for the ultimate indulgence in tropical paradise! With your wonderful gift, we will indulge in the Couples Aroma Bath spa treat on our Hawaiian escape at Sheraton Maui Resort! In the calm open-air settings of Black Rock Spa, we will relax in individual Jacuzzi tubs with an aromatic blend to enhance tranquil and sensual feelings. The rich aromas will reach the subconscious and trigger a profound effect on the mood to inspire romance, which is perfect for our tropical getaway! Together we will discover the special indulgence of romance with a Couples Massage at Sheraton Maui Resort! While lying side by side, we will receive a personalized massage in the privacy and comfort of Black Rock Spa's indoor or outdoor couples' room. The soft sounds and gentle breezes will calm our minds while our bodies are relaxed with long soothing massage strokes, and an extraordinary blend of aromatic oils. Thanks to you, we will experience pure bliss! Mai Tais for Two is a wonderful gift for this once in a lifetime trip at Sheraton Maui Resort! First a mini mai tai will be set up for two, including Pipikaula Dip with Lavosch. Thanks to you, paradise will be discovered from the comfort of the room! With your thoughtful gift, the Pu'olo Bundle will be a delicious treat at Sheraton Maui Resort! Pu'olo is the Hawaiian word describing a package of 'ti' leaves tied into a bundle; the green 'ti' leaf is believed to have special powers of protection. The bundle includes two 2oz. Chocolate Covered Macadamia Nuts, two snack packs of macadamia nuts, two snack bags of Maui Chips, one 6oz. package of Macadamia Nut Cookies and two 10oz. bottled waters. At Sheraton Maui Resort, a place of peace and calm awaits with the Pu'u Keka'a Stone Massage in Black Rock Spa! In connection with the healing of Pu'u Keka'a, the therapist will help discover 'heaven on earth' using the energy of warm, smooth stones and soothing massage strokes. This will relieve any stress and leave the mind, body and spirit rejuvenated! Black Rock Spa at Sheraton Maui Resort offers an invigorating experience with the Refreshing Facial! This facial includes a mask enriched with Vitamin C, anti-oxygenating berries, soothing cucumber and healing aloe to awaken the senses and refresh the skin. 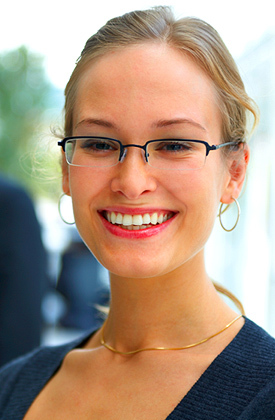 Thanks to you, the skin will be glowing radiantly! 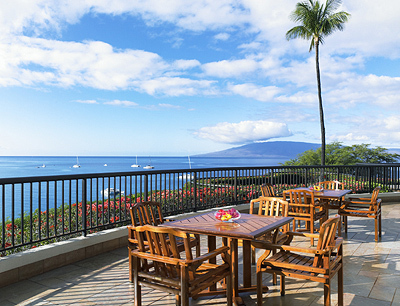 On this tropical getaway at Sheraton Maui Resort, it will be time to take delight in this sumptuous treat! This amenity includes a bottle of Kendall Jackson Chardonnay or Cabernet Sauvignon and a selection of imported cheeses served with assorted breads and crackers. Thanks to you, pure bliss will be experienced while admiring a beautiful Hawaiian sunset from the private lanai! The Tropical Delight Manicure and the Sole Smoothie Pedicure on this vacation at Sheraton Maui Resort is a wonderful gift! The sweet nectar of papaya, pineapple and natural fruit enzymes will soften the hands before receiving a warm mango hand and arm massage for the manicure. Then, enjoy a coconut milk foot soak accompanied by a sugar, papaya and pineapple foot scrub before receiving a soothing foot and leg massage with coconut oil for the lavish pedicure! 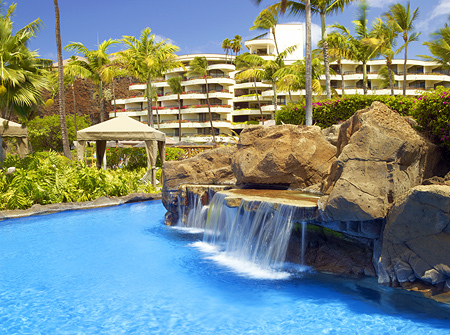 It will be time to discover the sweet luxuries of paradise on this Hawaiian escape at Sheraton Maui Resort! This amenity includes a chilled bottle of Moet and Chandon "White Star" Champagne accompanied by a platter of fresh, sliced tropical fruits, cheeses and chocolate tuxedo strawberries. On this tropical escape, traveling through the islands of Polynesia at a beachside luau will be a wonderful gift! While indulging in an all-you-can-eat grand buffet and an open bar, it will be time to experience the songs and dances of the Polynesian cultures at Sheraton Maui Resort! Parasailing will be a memorable experience! On a deluxe 800' parasailing flight, admire breathtaking views of Maui from a bird's eye view. Thanks to you, creating exciting memories on this amazing adventure will be wonderful! Taking part in the Premier Snorkel Cruise at Sheraton Maui Resort will be a wonderful gift! Depart from Ka'anapali Beach on a 65' catamaran for a day of unbelievable snorkeling. While cruising through the stunning Pacific Ocean, stop at two locations to witness the colorful fish and other kinds of amazing marine life in an underwater world of beauty. Also included in this snorkel cruise is a delightful continental breakfast, a tantalizing BBQ lunch and an open bar. Sheraton Maui Resort offers an exciting excursion! Board a luxury catamaran and cruise through the sparkling waters of the Pacific Ocean while admiring the lush coast of Maui. On the Sunset Cocktail Cruise, enjoy the open bar and indulge in sumptuous appetizers while witnessing the sun setting below the sparkling water's horizon, starting the evening off right! The Zipline excursion is the perfect gift! Soar high above lush foliage, winding streams and cascading waterfalls on eight amazing ziplines in Ka'anapali. Also included in this adventure is a delightful continental breakfast or a sumptuous lunch. A stay in the Resort View Room on this tropical getaway is a lovely gift! The rooms are beautifully decorated with fresh splashes of whites, tropical beach hues, dark hardwood accents and fine furnishings. Boasting king size beds with luscious linens and luxurious amenities in the bathrooms, both rooms have a private lanai with breathtaking views of the enchanting resort! 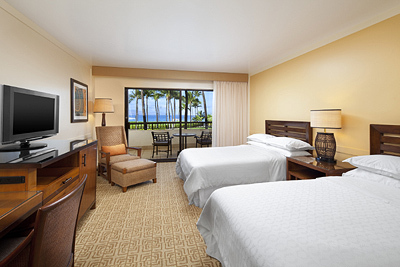 Sheraton Maui Resort offers the Ocean View Room! This tropical retreat is designed with a palette of soft creams, beach tones, exotic hardwoods, fine furnishings and Hawaiian decor. 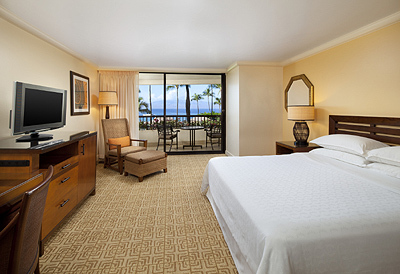 The Ocean View Room promises an inviting king size bed with plush bedding, lavish amenities in the bathroom and a private lanai with sweeping views of the stunning Ka'anapali Shoreline and the resort's sparkling blue pool! Thanks to your lovely gift, it will be time to indulge in the surroundings of the Ocean Front Room! Beautifully designed with accents of creams and earthy colors that enhance exotic hardwoods and fine furnishings - experience the charm and comfort of this island paradise. The Ocean Front Room features a king size bed with inviting linen bedding, exclusive amenities in the bathroom and a private lanai with spectacular vistas of the sparkling Pacific Ocean and the historic Black Rock! 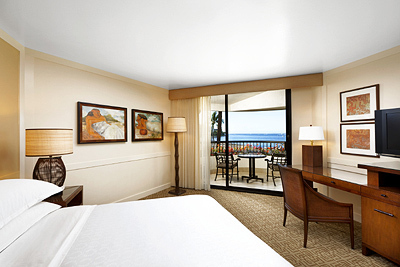 The Deluxe Ocean Front Room promises tropical elegance and enchantment! This room is beautifully designed with fresh whites, dark exotic hardwoods, beach tones, fine furnishings and Hawaiian decor. This haven presents a king size bed with delicious bedding, extravagant amenities in the bathroom and a private lanai offering breathtaking views of the stunning Pacific Ocean! 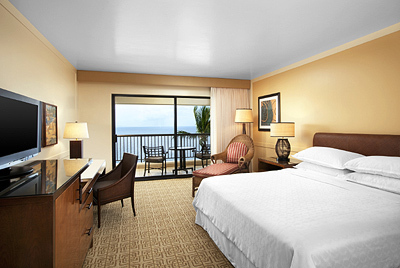 A stay in the Deluxe Ocean View Room at Sheraton Maui Resort is a lovely gift! This haven is decorated with accents of soft whites, creams and beach tones that enhance the fine furnishings with tropical hardwood accents. The Deluxe Ocean View Room offers a king size bed with luxurious bedding, extravagant amenities in the bathroom and a private lanai with stunning views of the shimmering Pacific Ocean! The ultimate indulgence awaits in the surroundings of the suite! 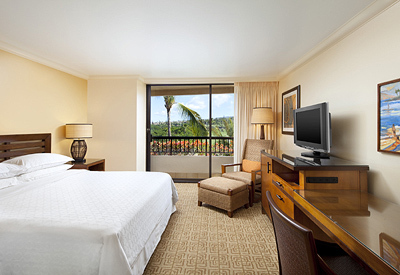 Sheraton Maui Resort offers luxurious suites that are beautifully designed with Hawaiian decor, and decorated with a palette of creams, beach tones, tropical hardwood accents and fine furnishings. This spacious suite features a wet bar, a living area, a king size bed with inviting linen bedding, exclusive amenities in the elegant bathroom and a private lanai with alluring views of our grandiose paradise! 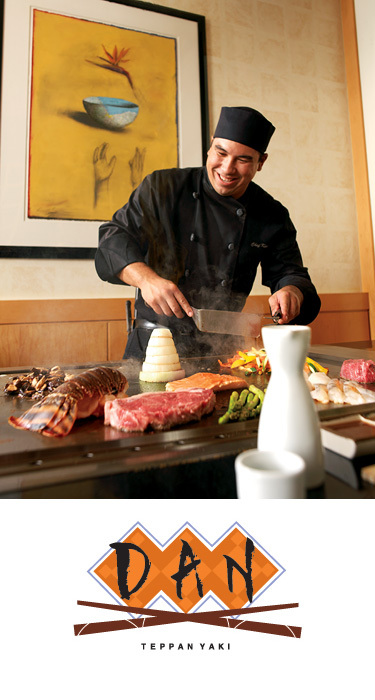 Sheraton Maui Resort offers an enticing dinner at Teppan-yaki Dan! Surrounded by the exotic flair of the Far East, an artful array of contemporary Japanese cuisine grilled to perfection. Amazement is sure to set in as talented chefs twirl their knives and create volcanoes of fire while serving up ginger fried rice, lobster, steak, teriyaki chicken and more! Boasting a thoughtfully prepared a la carte menu of succulent seafood and perfectly seared steaks, Black Rock Steak & Seafood offers impeccable service in a charming atmosphere. Dine indoors in the exotic decorative atmosphere or outside on the patio while enjoying the gentle Hawaiian breezes and admiring a beautiful sunset! With your lovely gift, we will experience a romantic evening at Sheraton Maui Resort while dining under the stars! In the splendor of a lush exotic garden, beside a cascading waterfall or in the privacy of Sheraton Maui's beachfront dinner bungalow, we will enjoy the "Cupid" dinner menu, featuring sautéed opakapaka (snapper). We will take delight in our fine dining experience with a private butler and our personal selection of the perfect dining location amongst lush foliage and stunning ocean views! At Sheraton Maui Resort, we will indulge in the tropical elegance of romance! In the splendor of a lush exotic garden, beside a cascading waterfall or in the privacy of Sheraton Maui's beachfront dinner bungalow, we will dine under the stars, enjoying the "Moonlit" dinner menu, featuring filet mignon. We will enjoy our fine dining experience with a private butler and our personal selection of the perfect dining location amongst lush foliage and stunning ocean views! 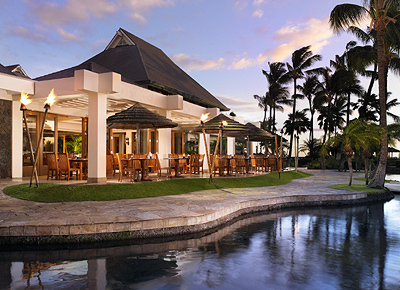 Sheraton Maui Resort promises us romantic charms and enchanting ambiance while dining under the stars! In the splendor of a lush exotic garden, beside a cascading waterfall or in the privacy of Sheraton Maui's beachfront dinner bungalow, we will enjoy the "Stargazed" dinner menu, featuring baked island prawns with crab mousse. We will take delight in our fine dining experience with a private butler and our personal selection of the perfect dining location amongst lush foliage and stunning ocean views!